Why go in spring: Locals come to this Southern California bay year-round to hike, bike, and escape the sound of freeway traffic. But with wildflowers like California sagebrush at their peak, the wetlands are at their best in April. Regulars call it: The Back Bay. Bragging rights: With about 1,000 acres of native habitat, the Upper Newport Bay Ecological Reserve and Nature Preserve is the largest natural estuary in SoCal. Native plants to watch for: Cattails, cottonwoods, willows, and the endangered salt marsh bird’s beak. Most scenic time: At high tide (check ), only the tippy-tops of pickleweed and cordgrass mounds are visible on the water’s glassy surface. What to bring: Comfortable walking shoes, binoculars, SPF 30, a water canteen, and snacks. 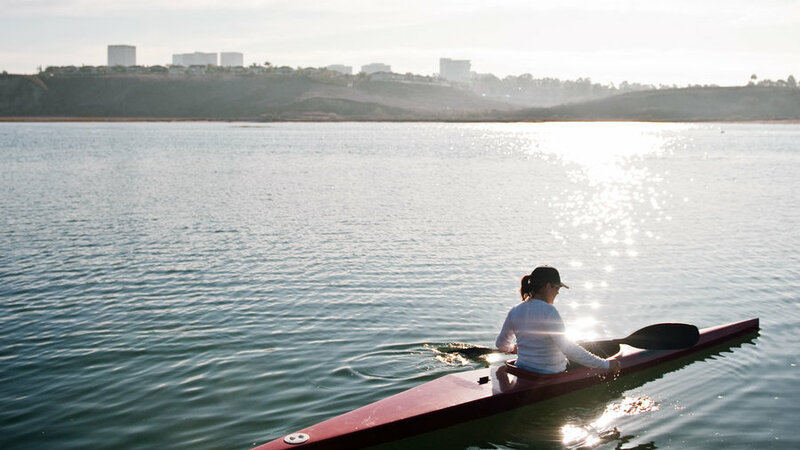 See it by kayak: Take a two-hour guided tour of the reserve with Newport Bay Naturalists and Friends (10 Sat–Sun; $20; reservations required; 949/640-6746). A view from the water: For a solo paddle, rent a kayak from the at North Star Beach and head out onto the glassy bay. Watch for birds, leaping mullet fish, sea lions, and the occasional dolphin. It’s 30 minutes from the center south to Balboa Island, where you can pull in on a beach and treat yourself to the island’s namesake ice cream bar. From $14 per hour; 1 Whitecliffs Dr.
Wildflowers are at their peak this time of year, making Newport’s Back Bay Loop the perfect destination for a scenic hike. Discover this ‘hidden’ oasis filled with birds and other assorted wildlife, that’s really just the shortest of drives from the town’s center. Pick a trail:The 10-mile Back Bay Loop circles the bay. You can jump on any­where, but we recommend starting at the Vista Point lookout for the best views. Walk along the bluffs; when you reach the southeast side of the bay at Big Canyon, detour off the main path and cross the footbridge. You’ll hit a shaded nature trail alongside a stream that’s known as a hot spot for bird-watching. Bring your binocs. Look for street parking near Eastbluff Dr. at Back Bay Dr.; 949/923-2290. Refuel with a hearty brunch­­ – and a Bloody Mary or two – at the Back Bay Bistro. Brunch with a view: The Back Bay Bistro at Newport Dunes resort is a 3-mile walk from Vista Point, or a short kayak trip across the bay (you can also drive). With 15-foot-high glass windows and a retractable roof, the waterfront patio is a sweet spot for Bloody Marys, omelets, and killer views. Brunch Sat–Sun; $$$; 1131 Back Bay Dr.; 949/729-1144. Get the lay of the land (and pick up a free map of the Back Bay) from the Peter and Mary Muth Interpretive Center. Get your bearings: The Peter and Mary Muth Interpretive Center blends so well into the bluffs, you might miss it from the street. The flat roof doubles as an observation deck; inside, you can grab a free map of the Back Bay. Right now, the center’s Boand Butterfly Garden is blooming with flowers like blue-eyed grass, Parry’s phacelia, and yarrow. Free; 2301 University Dr.; 949/923-2290. A cute cottage at the Newport Dunes Waterfront Resort and Marina. Make it a weekend: Book a cute cottage at the along Pacific Coast Highway. The resort is primarily for RVs, but there are also two dozen studio or one-bedroom cottages with kitchenettes and bathrooms. When you’re not lolling on the front porch, take a dip in the pool or rent a beach cruiser bike ($10 per hour, $15 half-day) or kayak (from $20 per hour), and take off to explore the shore. From $69; 800/765-7661. Near Santa Barbara: Figueroa Mountain, a half-hour north of Los Olivos, is in full bloom. Park in a turnout along paved Figueroa Mountain Road for hills blanketed with purple lupines and orange poppies. Along the 2-mile (each way) Ballard Trail, spot chocolate lilies, lupines, milkmaids, and shooting stars. $5 day pass; (pass info) or 805/925-9538 ext. 246 (flower report). Near Big Bear: At the Baldwin Lake Ecological Reserve in the San Bernardino National Forest, walk the 1-mile interpretive loop through hot pink checkerblooms, light blue irises, light purple rockcress, and yellow violets, with views of Bear Valley, Bear Mountain, and Gold Mountain. Free; 909/866-3437. In Orange County: Bouncing back from a 2007 fire, Limestone Canyon and Whiting Ranch Wilderness Park in Trabuco Canyon should get a bumper crop of “fire followers” like Indian pink, blue-eyed grass, wild cucumber, ground pink, and mariposa lily off the 0.5-mile (one way) Billy Goat Trail. Bonus: stunning rock formations along Red Rock Trail. $3 parking; 949/923-2245.